Fiona is 2 1/2 years old and shares a birthday with my youngest child. We adopted her from The Buster Foundation in metro Detroit after the death of our beloved lab/Sharpei mix. Fiona had been abandoned in a garage during the hottest part of the summer. She was also heartworm positive. Buster rescued her and then adopted her to us. I am happy to say that she is now 100% healthy. Initially my extended family was skeptical (if not outright critical). "Really? A pitbull? What are you thinking? You have two toddlers!" But after interviewing many dogs we decided to adopt Fiona and it was the very best decision we could have made. She has become the anchor of our family. My toddler boys (2 & 4) adore her and she has never shown any people aggression. She is so sweet, loving and cuddly. I thank my lucky stars everyday for bringing her into my life. Very cute. 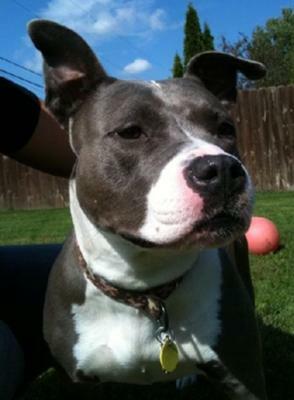 She looks alot like our last pitty, Mutley girl. They are such adorable babies. What a pretty girl! (And with a fabulous name.) I love it! Such a great rescue story too. Thanks for adopting. Give her a pet for us please!